New Company in Phoenix? What Signs Will You Need? You are finally taking the plunge. Moving out of the spare bedroom, basement or garage, you are opening your own storefront or office. Now is a good time to contact Spotlight Signs and Imaging Solutions and ask, “What signs do new businesses need in Phoenix?” In fact, we get plenty of these inquiries from entrepreneurs who want to hit the ground running, generate plenty of interest in the new business before the grand opening and who realize that only excellent signage will persuade a person walking by to step closer and check out the company’s products or services. These signs address motorists and passersby. They are a mix of advertising genius and way-finding tools. 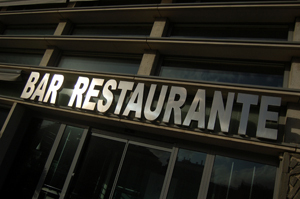 Your exterior signage should be in harmony with the typeface and logo display on your letterhead and business cards. If you do not yet have designed your logo, talk to our friendly graphic artists. We can get you started with designs and font options that bespeak your company’s niche, attitude and product or service selection. Choose from acrylic or foam letters, channel lettering or light box cabinets. Business owners have discovered that the combination of permanent exterior and temporary or semi-permanent window signage makes for a powerful combination of marketing messages. The windows are already part of your structure; use them for more than just hanging shades. We can create decals, posters and window graphics that display your business hours, highlight specific services or products, and tie in your specials to the seasons. Vinyl lettering is suitable for all climates and does not fade even in the glaring sun. Lobby signs set the tone for the interaction between clients and your representatives. Do you want the appearance of your lobby to be formal, sophisticated, avant-garde or quirky? Your signage greatly influences the design elements that provide the background to your lobby furniture. Choose from acrylic logo panels, foam or metal laminate lettering. Way-finding signage is another must-have. Whether you run a store or an office, you want your visitors to find their way around the venue. Make sure you have signage that points to the restroom, the meeting rooms and the fire exits. If you have stairs or elevators, it is a good idea to hang signs pointing to them. ADA signage keeps your business in compliance with current legislation. Choose from safety and facility signs with proper color offsets, choose grade II Braille and remember to clearly mark accessible doorways and parking spaces. Although not absolute necessities, marketing signs are perfect for increasing interest in your business and getting folks to come in and check out what you have to offer. When you have your interior and exterior signage in place, these options make a huge difference to your bottom line. Ad markers include A-frames, posters, flags and banners. If all these signage options leave you confused, just give us a call. We can customize an approach that suits your needs and your budget. We can help you with the logo design, the sign creation, the permitting process and – of course – the installation. We hope you'll contact us for a free quote and be sure to follow us on Facebook!